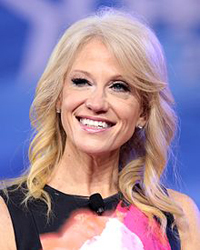 Kellyanne Conway will head the administration’s response to the opioid crisis, Attorney General Jeff Sessions announced on Wednesday. In an effort to combat opioid abuse, the DEA will establish a brand new division for drug enforcement efforts in Kentucky, West Virginia and Tennessee and will be based in Louisville. The government has decided to fund anti-heroin task forces with $12 million in grants. During the news conference, Sessions pointed out that he was hesitant about a law passed earlier this year that diminished DEA powers in the opioid fight. The law virtually excluded DEA authority to use immediate suspension orders to freeze suspicious shipments of pain pills, according to the Washington Post. It also weakened DEA orders to show cause that is used when companies fail to report suspicious narcotics orders. As a result, companies can submit corrective action plans before sanctions are enforced. Governor of New Jersey Chris Chistie was the previous presidential commission that made 56 recommendations on combating drug addiction. During a congressional hearing on Tuesday said the push for an opioid drug czar was overblown, according to Buzz Feed. Apparently he hasn’t been keeping up with the rising opiate related deaths around the country since 2012. Substance abuse articles from multiple sources show the epidemic has been reaching alarming numbers for years now. According to Christie, to fight opioid abuse, the government needs to limit over-prescription of painkillers, cut fentanyl exports from China and make Naloxone more readily available, the overdose remedy carried more and more frequently by first responders. Drug news sources like The Recover are hoping that the more the public is aware of addiction and the resources that are available people will seek help.